The classic picket fence is an enduring symbol of American life. If you’re looking for a way to add appeal to your home that is both functional and attractive, a picket fence is a great choice. But what is the best material for a picket fence – wood or vinyl? Probably the biggest reason most people install a picket fence around their home is for the aesthetic value. Picket fences have a timeless and unique charm all their own. Adding a picket fence to your home can improve its looks and value considerably. Along with the visual appeal, a picket fence can help protect your property. While they don’t offer the same level of protection as a privacy fence, a picket fence can help keep animals out of your yard and allows you to corral children and pets. Finally, a picket fence is a great way to create a clear boundary around your property or between you and your neighbor. If you want a great way to set your property apart from the surroundings, a picket fence is a good choice. Different styles of picket including straight, pointed and rounded (or “dogeared”). Different spacings of pickets on the fence rail, from far spacing to flat-front fence. The choice between open-top and closed-top picket fences. More ornate options including rounded fence panels or alternating pickets. Different styles of posts and post caps. One of the benefits of picket fencing is you can combine several different options to create a custom fence that is truly your own. Want a fence with alternating straight and Gothic-cut pickets and ornate fence caps? You can get this look or any other one you want with a custom picket fence. Traditionally, picket fences were made of wood. While wooden picket fences have lots of historic appeal, they actually don’t make excellent fences. Wooden pickets require lots of upkeep, including painting, sealing and cleaning. Even when they’re well-maintained, they still don’t last too long. Vinyl, on the other hand, has several advantages. 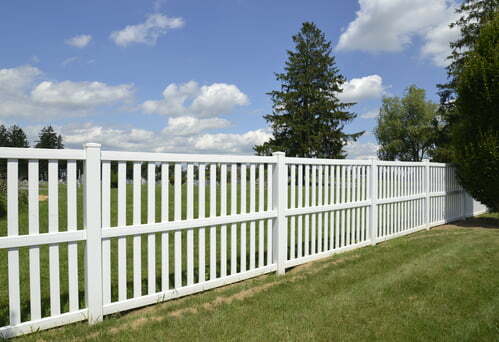 The first advantage of vinyl picket fence is durability. Vinyl fence lasts far longer than wood fence since it doesn’t absorb moisture or attract insects. A well-built vinyl picket fence can last as long as the house it surrounds. Plus, vinyl fences won’t fade or become brittle over time, even in the hot Texas sun. Another benefit of vinyl picket fence is it requires much less maintenance and care than wood. Vinyl fences do not need to be painted or stained, nor do they need frequent cleaning. Vinyl also requires less repair than wood, since individual pickets do not warp or break down over time. Vinyl picket fences offer all the same aesthetic benefit of wooden picket fences – and they have the added benefit of keeping those looks longer. You can get a vinyl picket fence in any of several colors, including classic white or more modern tan and chestnut brown colors. This allows you to choose the exact look you want for your home and keep that look for the lifetime of your fence. Ready for your own vinyl picket fence? Contact us today at Future Outdoors in Dallas. We’ve installed hundreds of miles of vinyl fence in the DFW area, and we’re ready to take on your project too. Call us today at 972-576-1600 or visit us on Facebook to learn more.